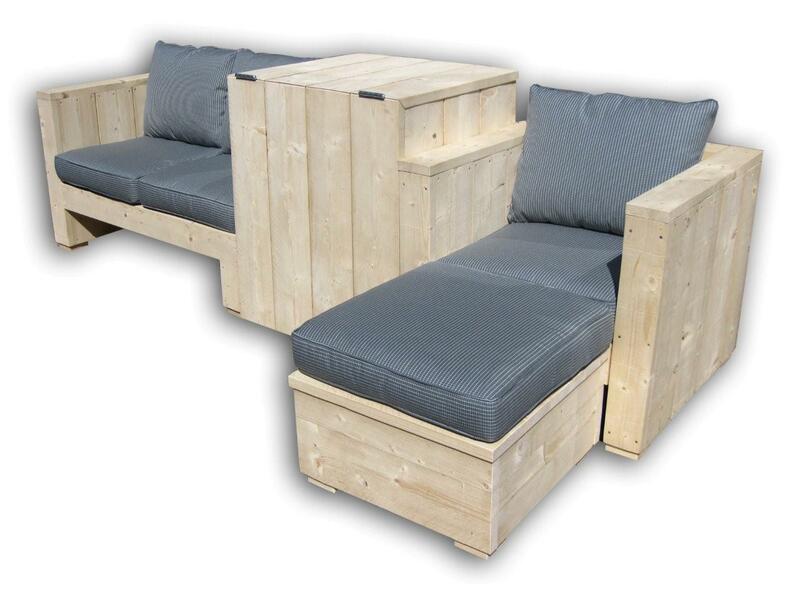 The ultimate lounge set: made from scaffold timber*, complete with cushions and a wine cooler for refreshing chilled drinks! If you list the following keywords: cold drinks, outdoors, garden, (roof) terrace, lounge, hip, trendy, comfortable and sturdy seating you are actually summarising this great product! We can supply different combinations all manufactured from beautiful freshly cut timber, (white wood) with a rough appearance. The lounge set is suitable for indoor as well as outdoor use! The cooler supplied with this set is the PT-S 40 WK model with two temperature zones. It can be used to store all types of drinks: wine, soft drinks, beer etc. The cooler is entirely custom-built into the lounge set and its encasing can be closed completely so that it is invisible when you are not using it. You and your guests can help yourselves to drinks anytime you want! Any combination featuring an armchair, chaise longue, footstool or sofa is possible. The unit is supplied complete with an attractive set of cushions (available in different colours). It is also available for rent and can be supplied with the PT-S 200 BC model. * The cooler also operates in low temperatures, which makes it ideal for use in the autumn, winter and spring! * The lounge set is produced in collaboration with Mentrop carpenters. Below you can see a few possibilities. Custom made lounge sets are also possible!